Should phones be royally forbidden at weddings? Smartphones at weddings. Are you for or against? Chances are you probably haven’t made it onto Harry and Meghan’s wedding guest list – but on the off chance you have, you can forget updating your Insta story on the big day. Royal wedding rules state that all guests must “surrender mobile telephones…and any devices used for image capture”. Okay, so it probably makes sense for the Royals but what about us regular folks? Should guests be allowed full use of their smartphones at weddings? Or are tech-free nuptials the way to go? Here are some pros and cons. Eliminating smartphones from the reception means everyone is paying full attention to what’s going on. After all, loads of effort’s gone into planning the big day – and experiencing it through a phone screen means you’re not wholly present. Any good wedding relies on people interacting. Let guests know that the photographer is taking candid shots, which will be made available to everyone so they can focus on chatting and enjoying themselves. If you Google “unplugged wedding” you’ll find countless stories from photographers about guests getting in the way of wedding photos because they want the same shot on their phones. You can only imagine how annoying that must be. Also, a flash from another camera could potentially ruin a professional photo being taken. Make a wedding photographers day by putting a ban on friends and family interfering with their shots. Do you really want all the wedding guests posting pictures on their social media? What if all the people you didn’t invite see? Or worse - what if you’re tagged in an unflattering photo of yourself with a mouthful of cake? Having a ‘no phones’ policy gets rid of any social media dread you might have on the big day. Having a tech-friendly soiree means you can relive the day through guests. All the best moments will be captured from all different angles and perspectives. Plus, you’ll be able to view photos instantly rather than waiting for the photographer to send proofs. Many couples even display a wedding hashtag on their website or cocktail napkins, so guests can feel free to snap and upload pics on social media throughout the celebration. A wedding hashtag also means you can find all your pics, from everyone, with one tap. Weddings are great places to meet people. In fact, it’s heavily encouraged. In the likely event you make a new pal at the bar, start chatting ‘property’ with a savvy real estate agent, or hit it off with someone in the photo booth, you’ll need somewhere to store their number. Just imagine trying to find a pen at a wedding. 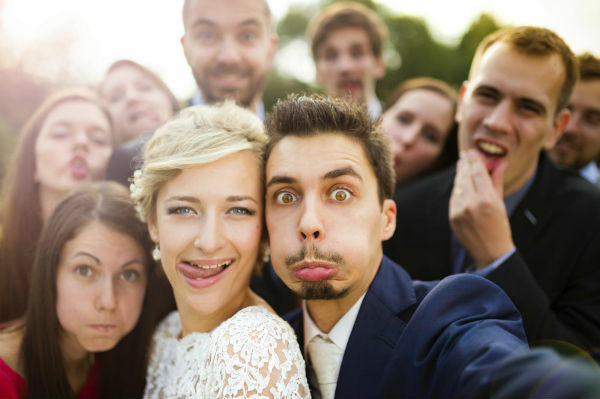 Let’s be honest, it’s the picture everyone wants – that coveted selfie with the bride and groom. Not only does it cement you as an A-list wedding guest but it’s the ultimate keepsake. It’s the equivalent of getting a selfie with the main act at a gig. I mean, imagine the likes you’d get on that bad boy? Do you think smartphones should be banned at weddings? Or do you say ‘I do’ to tech-friendly celebrations? Let us know in the comments below.